00:22:00 Makes 6 servings, 1-1/2 cups (375 mL) each. Makes 6 servings, 1-1/2 cups (375 mL) each. Our Chicken & Green Bean Skillet is a one-pot wonder. 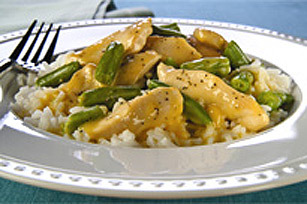 Served with rice, this cheesy chicken skillet is a shortcut to dinner. Add Velveeta and pepper; cook 2 to 3 min. or until Velveeta is completely melted and mixture is well blended, stirring frequently. Serve over the rice. To quick-thaw frozen green beans, microwave for about half the cooking time specified on the package. Thaw chicken in the refrigerator, allowing 5 hours for each pound of chicken. Never thaw chicken at room temperature due to the risk of bacterial growth. Serving Size Makes 6 servings, 1-1/2 cups (375 mL) each.